This book is a labor of love, written by Tom Herstad. Love Care and Share is all about our individual journeys to find our own truth about a happier life, better deeper love, and what is important to us. Very easy to read Love, Care and Share is uplifting, inspirational and gives us all pause for thought. We all need to take an opportunity to look inward. We all need to review our lives, and make better decisions to enjoy a better quality of spiritual and enlightening life. Cold, dark and destitute- a woman rummages through the trash searching for food and anything to keep her warm against the harsh elements. Homeless and helpless, her eyes met the eyes of love. Rosie was taken home, fed, clothed and offered a new chance at life. A life shattered by drugs, trapped in a vicious cycle of abuse, Rick had no hope for a normal future. Taken in, shown love, and given a chance- Rick found a new path for his life, and a newfound confidence. How can you become the light that shatters the darkness? Tom Herstad, a marketing major, entrepreneur and technology expert, has been bringing physical light into homes for many years and now is bringing transformational light into the hearts of families around the world with Margie’s Message of hope. One woman made the difference in numerous lives, and Margie’s stories can be adopted and emulated by us, to change the lives of others in our circle of influence. A sought -after and must-have speaker, Tom is offering his message of light and hope to a world in need. 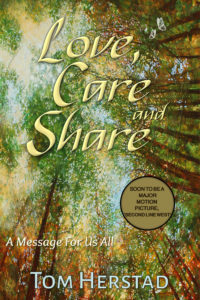 Love, Care and Share is available nationwide, and on Amazon.com. Despite her childhood hardships, then losing the love of her life and becoming a young widow with four children, the beautiful, vivacious Margie dedicated her life to loving, caring and sharing her wisdom. Margie opened her heart and her home to help those who needed her loving guidance. With unswerving dedication to her family and friends, she transformed lives and inspired joy and hope in everyone through her generosity, sense of fun and unfailing faith. The many recollections within this uplifting tribute to a unique, sweet soul portray Margie’s loving legacy. Love, Care and Share will inspire you to find what is most important to you. You will discover your own truth, and how everyone, everywhere, every day has opportunities to make a positive difference. While preparing to write this book, I booked a trip to Cuba at a remote resort on the peninsula of Cayo Coco to center myself. I wanted to sit in a lawn chair, stare at the stars, gaze at the ocean, read the “Autobiography of a Yogi,” eat fresh lobster and ride a scooter around the peninsula. I walked along the shore to find my inner spiritual strength. For clarity to make some decisions before embarking on this impending book completion commitment. My youngest sister, Julie, came along; we initiated this work four years ago after my mother’s passing. It was clearly time to blow more wind into the sail of this labour of love. My fun-loving sister would also bring depth of conversation. One of the decisions was how to find an editor and how to get this book published. Whether we view serendipitous occurrences in our lives as mere coincidences, I learned, as my Mom had often called it, “Godincidence” was at work right here on our way to Cayo Coco. When I took my aisle seat, I was glad to be seated next to a quiet couple. I could simply rest and read. For the first hour, that was what I did. Then I looked up and we connected, discussing the woman’s interior design business, among her other creative work, and my lighting business based in Toronto. I shared my love of reading spiritual books, the importance of family and love. When I mentioned my impending writing project, I realized that I had been randomly seated beside a published author who was an editor and an independent publisher. For the rest of our flight, I got to know Tanya Freedman and her husband, Austin, who weighed in with his life coaching and counselling experience. It was one of those, “Oh, that was quick, we’re landing!” flights. Time was nowhere in the exciting, engaging experience. One week later in the Cuba airport, I sat with my new green leaf coconut hat awaiting my flight. Here was Tanya walking towards me. This time we exchanged business cards and promised to keep in touch. On the plane taking my seat I realized that I was seated next to her again. On both flights! What are the odds of this? Then, as we kept sharing our thoughts, when and where each of us was born, we discovered that Tanya and my Mom shared the same birthday, May 14th. Was this a “Godincidence” at work? I told Tanya why I felt compelled to write this book, sharing stories. Despite her various projects, she agreed to receive the writing I had completed and would give me her opinion if this might be a book for our family or was there a bigger purpose? I assured her she need not worry about offending me with any of her personal and professional responses. I emailed Tanya my initial sixty-eight page draft, and waited. As I embarked on the journey to write my mother’s stories and celebrate her loving, caring and sharing nature, I got into the process of taking my thoughts and memories to the printed word. I realized that my mother was in my life for fifty years and that I was a participant in these stories. While including friends’ and family members’ tributes to Margie, I experienced something new and profound: my mother’s guidance is still at work in my life. In the first part of this book, I share my memories of Dad, the love of Mom’s life, describing what their marriage and interactions taught me about family and other relationships. About how deep losses in our lives affected us all, Mom in particular. About her secrets, which she kept hidden until it was almost too late. And how, like a rising phoenix, Mom fought her demons through sheer will power, all the while with an open heart, helping others. Many readers have been profoundly touched while reading and understanding the messages throughout these stories. Margie’s purpose in life was always about everyone she knew, to help them seek and discover the best within themselves. I also share my own struggle with love, and what I have learned along the way. How soon after losing my mother, I nearly lost the love of my life after proposing to her, because, frankly, I was not yet ready to love fully. The earlier chapters of the book tell my mother’s life story. The later chapters show Mom’s impact on those around her while rediscovering herself, and how she used her strength to influence and facilitate transformations of many people’s lives. These stories are my mother’s legacy to us all. I’m a visitor here in Canada for three months. I had an appoitment to meet with my friends in front of Chapters. Just looking around in Chapters, I met you, Tom, and you told me and my friend about your mom’s story. Then I wanted to buy this book and bought it. What an amazing title Love, Care and Share is! Thank you for writing me ‘May this help light your path.’ in the book with your autograph. I bought this book with apprehension because of my own loss of my mother… she was the person I most admired in the world… I honestly could not put the book down and can not thank you enough for writing it… I also am so appreciative to be part of your web site The Home Page has the best two quotes that fit my personality, values and beliefs…. You have replenished my soul that there are those people in the world that grew up with the love, strength, spiritual beliefs and family beliefs that we grew up with… your story was so sad but your mom found strength by giving to others who are worse off ( although to me her situation was very difficult). Take care and thank you very much for this treasured book that I know I can share with quite a few people to inspire them in some way.